With time, as I find better ways of doing things, I update older posts and recipes. This is an edit to a post I published 4 months ago on my other blog, Fair Trade Frankincense. I’m going to mix things up a bit and post it here on Apothecary’s Garden since I seem to have accumulated a different following on each blog. To read the full post, which tells you exactly which types of Frankincense contain the anticancer and anti-inflammatory Boswellic acids, you can click the link below and check out the full post. Boswellia Papyrifera-Pure Resin extract. For medicine, incense or Perfume. I first came across the pure resin of Frankincense after distilling Boswellia Papyrifera. Gorgeous pools of caramel coloured resin rested on the bottom of the cold still and looked good enough to eat. I discovered that this pure resin from which all the water-soluble gum had been removed, dissolved easily in warm oils without the grittiness that raw Frankincense delivered with its gum portion. 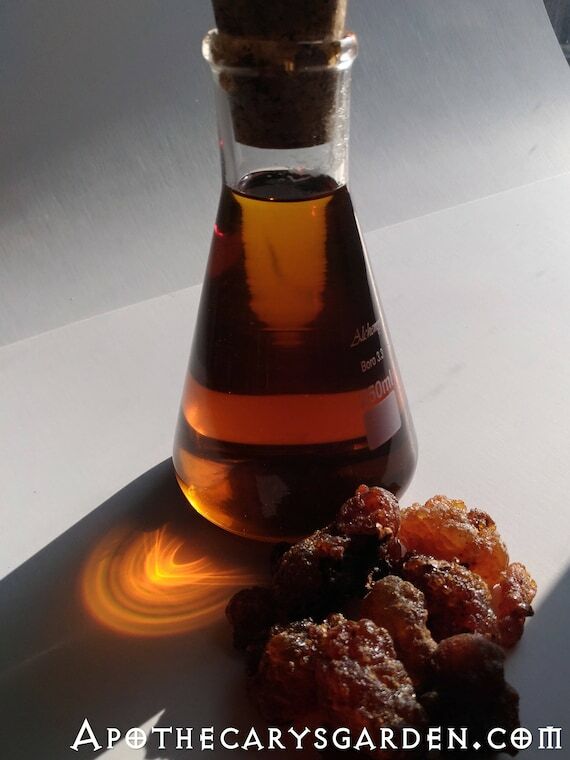 Since many of the therapeutic compounds that Frankincense offers us are found in the resin and are not present in the essential oil, I started incorporating this resin extract in a number of my products and thought it would be a valuable material to share with other Apothecaries, Herbalists and Cosmetics formulators. If you have ever tried to make an oil based product such as a salve or creme from whole Frankincense, you already know that the water soluble gum in it makes it gritty and must be carefully filtered out to create a creamy smooth product. In the past, I mentioned it could be taken internally which is true. But, I believe that if you want to benefit from the Boswellic acids present in the resin, the best method is to powder the whole fresh resin and take it either in capsules or by the teaspoon with water as I do when the need arises. In my humble opinion it is usually best to stick with a whole, natural, unprocessed and unadulterated product when possible. We don’t really know why or how things work, and I suspect there are good reasons different compounds appear naturally in a plant. So if there is no need to refine it, my choice will always be to use the whole plant material. If you would like to take concentrated Boswellic acids internally,there are commercial and factory produced products on the market that are standardized to 60%-65% Boswellic acids. A percent that is likely close to what is already present in the fresh oleoresin. Though this pure resin is a byproduct of distilling Frankincense, not everyone distills or knows a distiller from whom to it. For this reason I present a method for separating the resin from the gum at home without the need for distilling apparatus. Though some of the essential oils are lost through the heating process, it is easy enough to add essential oils to your product during the cool-down stage of your finished product if you so choose. The fact that all the Boswellic acids, including the much studied AKBA, ( acetyl-11-keto-β- boswellic acid ), reside in the resin is fortunate for us. This means that we can easily utilize certain types of Frankincense for their Boswellic acid content and its anti-inflammatory and anti-cancer properties in healing oils, salves and cremes. Before going on to describe the extraction method, I have to add that we in the West are buying a growing volume of Frankincense essential oil each year, sometimes at astronomical prices, thinking that we are benefitting from these healing compounds when in fact, the resin that contains all the Boswellic acids, is usually discarded by the distillers as waste, or sold off as inferior incense locally. This is the product we should be buying for its healing compounds, not the essential oils. We should most definitely NOT be ingesting these pure concentrated essential oils thinking we are consuming Boswellic acids. We have to start thinking more clearly. These trees will not last forever. Most all Frankincense and Myrrh trees that supply our resins live in the wild, along with their harvesters, under harsh conditions. As they are harvested with increasing frequency to meet our demands, the trees become stressed, produce less resin, yield seed that has a lower germination rate and thus cannot reproduce and regenerate their numbers in the manner they normally do. In short, our increased demand is leading us to a decreased supply. This doesn’t mean we should take a passive approach and stop buying Frankincense. That would be a blow to communities who already struggle, and it would simply create a back door and a black market. We need to take an active role instead. Before it is too late. Neither the trees nor the harvesters are benefitting from our increased demand for essential oil of Frankincense. Harvesters, clans, communities in developing countries, see only a few cents of that $50.00 or $100.00 bottle of Frankincense essential oil. Currently not a penny of our’s goes back to propagating or sustaining the trees, and the harvesters often see just enough to get by. In February 2016, after a couple of years communicating with harvesters and elders, flirting with financial, academic and government stakeholders, I will be in the Horn of Africa again. I believe there is still time to set up a different model of trade for these precious, fragrant and medicinal resources before they are lost. We need programs that sustain both the trees and the harvesters, who are their only stewards. I have a growing vision of a model based on fair trade practices. It is direct, ethical and sustainable, benefits local ecologies, economies and social frameworks. It supports the harvesters and their communities in stewardship of the land and propagation of the trees in the wild to ensure future harvests will meet our growing needs. This world in all its gorgeous diversity is our Apothecary’s Garden. It’s up to us to take care of it. The water-soluble gum will dissolve and disperse in the water while the pure oleoresin, the resin with the essential oils, will exit and float around the outside of the sieve. The bark and other foreign matter will collect in the sieve and not pass to the water. When the sieve is empty of gum and oleoresin, set it aside. Set the pot of hot water aside to cool. As most of these oleoresins do, they will generally settle to the bottom of the pot as the temperature drops. When the pot has cooled, pour the contents through yet another fine mesh sieve and add the bits of resin you collect in the sieve to your main bowl of collected resin. You can collect and save this liquid if you like. Though mostly made up of water-soluble gum, it is very potent and fragrant. It can be added to bath water for a fragrant, healing bath and kept in the fridge for a week or two. My roommate has experimented with drinking it. He has combined it with different fruit juices and is developing a personal blend. I believe that as long as he does so in moderation it will do no harm. The aqueous solution or tea of Frankincense has been used for hundreds if not thousands of years in traditional medicine for coughs and colds, to stimulate brain function and memory and as an aphrodisiac and tonic. This leftover Frankincense water is quite similar to what you would get from such a tea. Taking it internally is, without a doubt, of less harm and more benefit than ingesting the undiluted essential oil of Frankincense. There are likely more Boswellic acids floating around in this “tea” than in a comparable amount of essential oil of Frankincense. It is bitter so cutting it 1/2 and 1/2 with something sweet helps. As always, pay attention to what your body says. Listen to it and you will know if it is good for you or not. Your resin extract still needs to go through the bath once more to remove traces of water-soluble gum. So, repeat the above process of boiling your filtered resin with fresh clean water in the pot. It should only take a few minutes of gentle stirring to wash the rest of the gum out of the resin, so after 3-5 minutes of the melted resin floating around, you can skim it off as before, and place it in a clean bowl to cool and set. Place it on a clean sheet or pan. A Teflon or silicone cookie sheet or something comparable. Preheat the oven to about 100 degrees Centigrade and place the pan in the oven. The resin will melt and flow releasing all the water in the form of liquid and vapor to the air. I tilt it this way and that to expose and pockets of water while it is hot and mobile. Often you can pour off the water as it is released from the resin. It takes from 5 to 15 minutes of the resin uniformly melted to dry it and it can be removed from the oven and left to cool. You now have a product with a substantial, therapeutically active proportion of Boswellic acids in a concentration much, much higher than you could ever get from a comparable quantity of essential oil without the risk that concentrated essential oils can represent. At the same time you likely have a healthy percent of Frankincense essential oils in their naturally occurring concentration and matrix. A visual reference for your extract. This is how it should look when you are done. Boswellia Sacra/Carterii resin extract beneath B. Papyrifera resin extracts. The same, but different. Each exhibiting expected variations in colour and fragrance. It is a substance that dissolves readily in warm vegetable oils, waxes and alcohol, and lends itself with ease to the creation of cremes, oils, salves and more. You know exactly what went into your product from start to finish. You know it wasn’t adulterated along the way, that no solvents, or fillers were added, and that you have a 100% natural product. Wonderful explanation! Thank you! I have 2 questions… 1. Why does it need to be so much water? 10 liters seems like a lot, can I cut that down a bit? 2. Can I use this same method for myrrh gum? Or is that water soluble like the pine resins? You can definitely try using less water. You can use the same method for Myrrh. 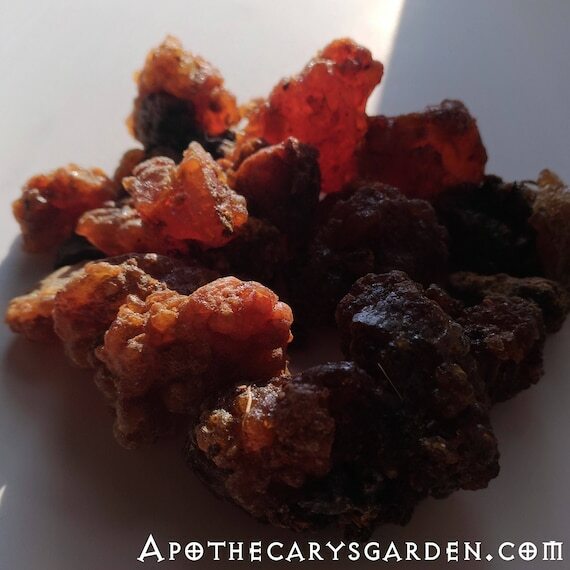 However, while Frankincense usually has about 25% water soluble gum that will dissolve and separate from the resin, Myrrh usually contains about 65% water soluble gum. The resin you will collect will be in much smaller quantities than Frankincense. And you might need to use more water since it will likely thicken with the abundance of gum that separates from the Myrrh. Thank you! I have 2 uses for both resins. 1. Soaps 2. Creams and salves. Do you think doing an oil infusion as then straining through a cheesecloth would be ok for the soaps? I plan on separating with the water method for the creams and salves. Yes, you can do an oil infusion of Frankincense for your soap. You could either strain out the grit which is the water soluble gum, or leave it as an exfoliant in your soap. after a very fun night of magical science i recovered 57grams of oleoresin from a pound of papyrifera. does that seem light, i have the water portion in the freezer to see if i can precipitate any more out. im going to try neglecta or sacra tonight and compare outcomes…. thanks for the inspiration and knowledge my friend…. Thanks Stephen. 57 grams sounds a bit low for B. Papyrifera resin. It’s about 12%> should be double that. Though the yield does vary depending on climate and harvest timing, it would be worthwhile to give that residue a good long boil and see if any resin consolidates for you. thanks for the quick reply my friend. i did a reboil and put it in the fridge and got 20 more grams of the magic pellets. i think i did not reach a rolling boil on my 1st run, the resins seem to need that frothing to collect. big blessings and have a beautiful summer…. Hi Dan, I’m so inspired by your blog and I think it’s incredible that you share the knowledge you have clearly worked so hard for. Thank you. I’m experimenting with your newest method of making the frankincense oleoresin and am wondering if you know of anyone using either the left over water or the oleo itself in cold process soap. Also, I read someone else’s question about essential oil and just wanted to clarify- the water that remains ( which I notice separates ) is a hydrosol, correct? Meaning the e.o. is trapped in there? Do you think any e.o. rises during the process of boiling the resin, and if so have you trapped it? Thanks again for what you share. Hi Marisa. I apologize for the late reply! The water that is left in the pot after making the resin extract is not the hydrosol. It does however contain the water-soluble gum and likely a small amount of essential oil floating on top. I have tried to put this (very bitter) water to use and have yet to find a good purpose besides adding it to bathwater. I know the resin extract can be used in soapmaking in the same way pine resin is used but I don’t know enough about the craft to give you advice on using the”washing water”. You may have to do some experimenting and let me know what you discover. I am sure other readers would benefit from your experience. What is the deposit that is left over? The products are resin oil, gum water, and white stones at the bottom. And in what is it soluble? I’ve been assuming its a type of salt/acetate. Can anything be done with it? I’m curious to test if it’s alcohol soluble. Hi and thank you for your question. There should be only 2 products separated in the process. 1- The pure resin that froths and pools, and 2-the water that is saturated with water-soluble gum. The only thing I can think of that might leave white stones on the bottom is if you did not use a sieve to collect the bark and stones that may have been picked up by the harvesters. If you do not think this is what is in your pot, I could perhaps answer your question better if you sent a photo or shared further observations about these products. This is an excellent question. Thank you. Studies have compared the uptake of Boswellic acids in the bloodstream when the powdered resin was consumed on and empty stomach, and when it was taken with oily food. The results showed that there was a much higher absorption rate with oily food and it is assumed the oils act as solvents to the resin and facilitate its breakdown, digestion and assimilation by the body. Please help. I am reading on boswellic acids for treating cancer. My good friend was just diagnosed with stage 3 multiple plasmacytoma. I want to send some boswellic acids and this post seems to show how to make it. However, once it is made, how much should he take? In what form, i.e., tea, straight with water? How often? Any input is helpful. I am far from an expert on treating cancer. That being said, if and when I am in a similar situation to your friend, I would take the powdered whole resin. When needed I take about 1/2 to 1 level teaspoon 3-5 times a day with food. Studies show the Boswellic acids and other oil soluble compounds in Frankincense are absorbed to a much greater degree when eaten with fatty or oily foods. This could mean Avocados, nuts, Brownies made with lots of butter, even Bacon and fries. The resin extract is excellent when one is making oils, cremes and salves with Frankincense. It does have a higher percent of Boswellic acids, but they may very well be better assimilated by the body in the with the gum and essential oil that are naturally present in the fresh Frankincense resin. That being said, I simply can’t say for sure whether the fresh resin or resin extract is more efficacious. There are no studies that indicate which works best. Your friend could definitely take the powdered Frankincense resin extract in exactly the same way I described above for the powdered fresh resin.. Which ever he chooses or prefers, he should start with small amounts and see how his body feels about it. 1/4 to 1/2 teaspoon 1 or 2 times a day. If everything is OK after a day or two he can increase the dose if he likes. Dan, Are you saying that the frankincense incense cones have the boswellic acids in them? I followed your instructions and made my own frankincense oil but keep the little bit that was left over. So that little bit left over is what has the boswellic acids? I really need to know. I don’t want to waste the acids. That is why I wanted the frankincense to start with. Any way please reply. It will help me alot. When you make an extract or infusion of Frankincense in warm oil, most of the resin acids including the Boswellic acids transfer to the oil. What you are left with when you filter the oil is the water-soluble gum which is mainly sugars and starches. Some people keep it and use it as an exfoliant in body scrubs. As far as the incense cones, it really depends how they were made. 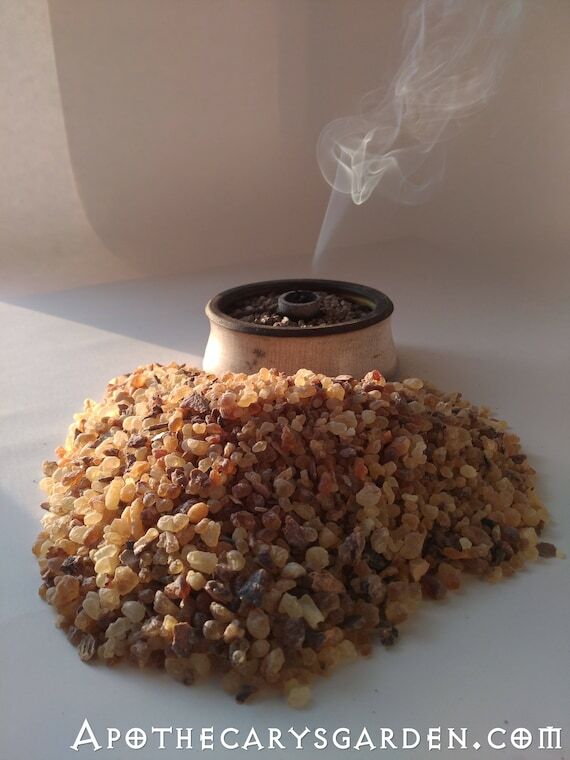 Many “Frankincense” incense cones and sticks are made using a combustible base material scented with Frankincense essential oil or a fragrance oil. If however the incense cones are made with the whole natural resin of Frankincense then there will be Boswellic acids in them. That being said, these resin acids are heavier pentacyclic triterpenoids and I do not know if they are delivered to us through the smoke of burning incense. I have been following your website for quite some time and I want to thank you for sharing your knowledge and experience. I find your journey inspiring. I’ve also ordered some of your products and they are superb. I finally took the plunge and attempted to make an oleoresin extract from B. Papyrifera and B. Neglecta. The Papyrifera turned out fine. But I’m not sure of what to make of the result of the Neglecta. The residue I collected does not harden like the Papyrifera did. Actually it seems more moss like in it’s texture. Would the cooled resin be that much different between the two? And one final question…I used my actual stainless steel pots for making these resins and now I cannot remove the gum from the sides. Do you have any suggestions? I don’t want to think I have to replace these 2 pots. Or that my sauces are going to be continually flavored with Frankincense. Although I may just start the next cooking craze. Any suggestions from you or other people would be much appreciated. Thank you for your kind words. I will see if I can help you with your questions. Boswellia neglecta and B. Papyrifera have very different chemical composition. As you discovered. I too tried to make a resin extract from Frankincense neglecta with similar results to yours. I believe that the “dark” B. neglecta is a special product the tree produces to create a band aid over a wounded area. It seems to be composed mainly of Lignan and reminds me very much of the callus resin generated by our Northern Spruce and Pine trees in response to injury. In the case of Spruce and Pine resins, there is a high percent of oleoresin present with the lignan and it is easy to separate the two materials when it is dissolved in warm oil or heated and liquid. I do this through a fine metal mesh coffee filter. Though I have set the weird, “mossy” extract of Boswellia neglecta aside for now, I hope to find the time to experiment and see if I can separate the pure resin from it with the same methods I use for Spruce and Pine callus resin. The lignan is neither oil or water soluble which makes it difficult to work with. There is a “Light” version of Boswellia neglecta resin which is clearly pure oleoresin. It is a little harder to come by but I believe you would get more satisfaction from it. It seems to be an almost pure oleoresin with little to no water-soluble gum and dissolves easily in warm oils “as is”. Regarding cleanup of your stainless steel pots, I have better news for you. I take a stainless steel scrub pad, I get them at the dollar store, and with a generous amount of generic olive oil as a solvent I scrub all the residual resins from the pot. It works quite well for me. Once the resins are dissolved I proceed to use warm water and dish soap to bring my pots back to clean and food worthy condition. Do you think you could distill the water portion and extract the essential oil from this process? Conversely, could you use the oleo gum left over from the distillation of frankincense? It would be great to have a process that could do both. Hi Maggie. If I understand you correctly, my answer will be- when we distill Frankincense oleo gum resin, it is separated into its 3 components. Essential oil in the receiver, Resin floating in the still surrounded by gum that has dissolved in the still water. I use the separated resin for cremes and salves since it has all the Boswellic acids and dissolves easily in an oil base, (like the sample I sent you?). I collect the essential oil and use the hydrosol in water based products, while the dissolved gum does not seem to keep well and I dispose of it. Likely didn’t answer your question!! Hi, How do you make powdered whole fresh oleoresin? Or where can I purchase some? How often can one consume the fresh oleo resin? I’m chewing on one piece daily. How much boswellic acid would one benefit from this method of consumption? Hi Janie. Here is a link to my post on how to grind Frankincense-https://apothecarysgarden.com/2013/03/22/how-to-grind-frankincense-myrrh-and-other-oleo-resins/. I sell the fresh resins in my online shop-https://www.etsy.com/shop/ApothecarysGarden. I personally will take 1/2 teaspoon of powdered Frankincense up to 4 times a day with water. I haven’t had a close look at the studies, and I am actually not sure there are any that address the percent of Boswellic acids in different types of Boswellia. They mainly measure the general content of resin acids including the Boswellic acids. Let me point out that many of the other compounds in Frankincense have healing properties, not just the Boswellic acids, so let’s be careful we remember to appreciate the whole and the natural synergy that is found in a whole plant or product, and aren’t fixating on one molecule to our own detriment. Hey Dan! Great info. Thanks for sharing! My question is….i use to extract essential oils from boswellias, now…. can i use the waste product to obtain this boswellic acid mass? The distillation process usually takes 9-12 hours. After this period of time and heat the acid within the resin it is not damaged? Yes!! That is a very important question!!!! To which I as yet have no answer! I can not tell you with certainty whether the Boswellic acids are detrimentally affected by 100 degrees for a few hours. There is no information i can find online, and I can see no studies on the subject. The material that comes out after a distillation can be an important byproduct the for distillers and I believe some do sell the post distillation resin to the pharmaceutical companies for processing and isolating the boswellic for the health industry. I wish I could be of more help. If you can dig up some I formation on the subject, please let me know.. Thank dr.Dan for a valuable info. In fact this is no specific method or technique to isolation of Boswellic acids from Frankincense . I hope you don’t mind to give a specific method to isolate it? Hi Maher. Thank you for your question. The process I describe is for the purpose of helping people make oils and cremes from the different types of Frankincense that contain Boswellic acids in their resins. Separating the oleoresin from the water-soluble gum makes this much easier. It is not a method of isolating the Boswellic acids. The title of this post may be misleading and I will change it. It is meant to describe the post as a method for isolating the resin of Boswellia which contains the Boswellic acids. I know there are laboratory processes that will isolate the Boswellic acids from these resins, but I leave them to the scientists and pharmaceutical companies that are set up for these things. Also, I am not a doctor Maher, just someone who works with plants. Such wonderful thinking and work you are doing and sharing! – Thank you. Inspired by you, I will now conduct an experiment myself. Core, wholeness and simplicity for me is key. I believe many of our medicinal plants are complete and ‘designed’ with a safety formula. I believe if we extract recognized beneficial constituents the safety has been broken. I believe that the safety formula goes beyond keeping humans safe, that it also serves to sustain Mother Earth; Rough example: extract the proteins from meat for human consumption and discard the rest as it has not been found beneficial to us. – I will grind resin and mix various amounts with a bit of liquid (any?) and then be looking for good case study individuals to do the same with. I also think people knowledgeable in herbal medicine need to work harder on making people aware every region of the world have healing plants right outside their own doors and we do not have to buy in on the latest ‘cure fad’ and consequently cause all sorts of $$ infused madness and depletion. Thank you for your comment Mette! Yes I agree with you on all points. There is much to be said for a more holistic approach to our medicine and our food. Though one can’t discount the great work our scientists and researchers are doing, giving us a deeper understanding of nature’s therapeutic elements and their mechanics, I believe we pay a price when we rely on single molecule solutions and sacrifice the dynamic synergies and intelligence inherent in each living plant and Nature as a whole. You make an excellent point that we can be blinded by the allure of the exotic. In the case of Frankincense and some of the other exotic oleoresins, we need to keep in mind that our Northern Conifers, among other citizens of our land, are very much an untapped treasure and offer us potent therapeutic powers that rival those of any desert shrub. Pine and Spruce saps have traditional and proven healing powers that we are only starting to appreciate. They make THE best medicines for respiratory and musculoskeletal issues, treat psoriasis, slow healing old wounds and ulcers and more. They are stimulating and grounding, raise our spirits, make beautiful perfume and incense ingredients, and I have no doubt there are many more gifts they hold for us that are as yet undiscovered. I hope we can find some balance and sanity before the impact of our Frankincense “Fad” is irreversible. The trees in Ethiopia and Oman are increasingly burdened and straining under the demand we are putting on them. I think only the strife and subsequent disorganization in Somalia has kept us at a bit of a distance from their trees, but I don’t think this will last much longer…. Thank you for your comment, and your purchase. As you may have discovered with further reading here, that Pine and Spruce saps are easier to use since they are pure oleo-resins with no water soluble gum. They dissolve directly in warm oils with no need for freezing or grinding. If you have any other questions please let me know. Yes this extract is chewable, much more so than the unprocessed raw resin. I just tried both before replying to you here. The fresh oleo gum resin of Boswellia Serrata, is more malleable and soft and tends to smear and stick to the teeth. The resin extract keeps its shape much like hardened Pine rosin, Mastic resin from Chios, and the traditional Frankincense Frereana from Somalia which is used across Arabia as a high end chewing gum. All these traditional “Chewing gums” share one common factor, that they have little to no water-soluble gum content. Hence, the more water-soluble gum there is in any Frankincense, the less suited it is for chewing. Thank you so much. So Boswellic Acid is not water souble? i mean how do you know you where extracting the boswellic acid. Second question, can you add pictures or video please of your setting? i dont understand it. I want to extract them for a person who need cure. Hi Renato. No the Boswellic acids are not water-soluble, they make up a big portion of the oil and alcohol soluble resins. My logic is, if we remove the part we know does not have Boswellic acids, then what we have left will have them. I will try to post a video in the next week or so. I understand it is easier to understand the process that way. In the meantime you could look through my other posts on the subject and perhaps they will add to your understanding of the process. Also, in my opinion, taking the powdered whole fresh oleoresin of these 3 types of Frankincense is likely the best way to benefit from the Boswellic acids internally. Can you tell please how much Boswellic acids should i use in Lotion or creme? Hi, Pat. When I make a lotion from the resin extract, I dissolve it in 3 times its weight of carrier oil and with the aid of an emulsifying wax blend it with distilled water. The % of resin extract in the finished lotion is between 10% to 20%. If you want a product with a higher % of resin extract and Boswellic acids, a 1 to 3 infusion in a carrier oil gives you about 33% Resin extract content in an oil, not a lotion. You can raise the quantity of resin extract and Boswellic acid in these products if you make a more concentrated infusion of resin extract in oil. A 1:2 or possibly 1:1 ratio which will be quite thick. I hope that answered your question. The oil infusion that these products are based on can also be made with a hot infusion of fresh Frankincense in a carrier oil.